In a competitive environment, a leadership responsible for its own development, willing to embrace change and able to act quickly even when confronted by uncertainty or an unfamiliar challenge is an organization’s greatest strength. Fostering a culture of development among core leadership is a most certain route to enhancing ones competiveness and realizing future business or academic opportunities. The objective of the Wright Leader Academy at Wright State University is to develop and strengthen leaders on our campus community and promote a culture of inclusivity and excellence for all supervisory/leadership positions. 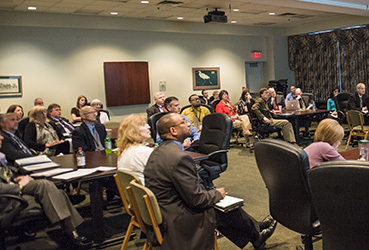 This cohort-based certificate program is our organization’s premier development experience and is intended to increase a leader’s capacity to contribute to the mission and strategic goals of Wright State University, increase collaboration among administration and academics, and foster greater organizational engagement among participants. The Wright Leader Academy is designed for those faculty and staff that serve in a management, supervisory or program management position and are ready to move into a position of increased leadership within the next few years. The program is scheduled to kick-off at the end of August and will include all-day sessions to be held monthly from September 2019 through May 2020. For Academy overview, application and selection process, please see below.